Black bean burgers are staples on restaurant menus that are making an attempt to offer vegan options, and they often lack a bit in the flavor and texture department. I love this burger recipe because it's quick, tasty, and stays together without turning into a mushy mess inside your bun. 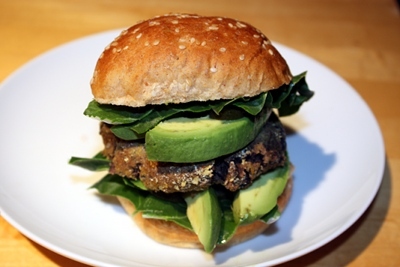 I came up with this vegan black bean burger recipe when I was in a hurry one night and needed to find a creative way to use my leftover black beans and barley from the night before. You could use any other beans instead, and you can also improvise a bit on the spices. I used ones that I think compliment black beans perfectly, and I started with less and then added more as I went. Like all beans, black beans are packed with fiber and protein, and they help clear your digestive tract, balance your hormone levels, and lower cholesterol, making you healthier overall. Add some good dijon mustard, ketchup, slices of tomatoes, onions, and some greens and load it all onto a great whole grain bun for a delicious and simple vegan black bean burger. If you're a busy mom or about to pop with a first child, it's a great idea to double, triple, or quadruple this recipe and freeze the finished (cooked) bean patties for later. I flash freeze bean burgers by placing them in a single layer on a cookie sheet and freezing until they are rock hard and pop right off the sheet. Then you can throw them back into a plastic bag in the freezer. You could also wrap each in parchment paper and load them into the plastic bag right away and that will prevent the burgers from sticking to one another. These vegan black bean burgers make excellent meals for children and would be perfect for a sleepover or inside barbecue (they won't stay together well enough to grill them outside). Heat a few tablespoons of oil over medium heat in a large saucepan. Assemble the flour mixture before you start making burger patties. Smash the black beans with the olive oil. Add the rest of the ingredients and mix together well, tasting to see if you prefer more spices. Form the mixture into patties about the size of your palm, and flatten slightly. Drop the patty onto the flour mixture and sprinkle more flour on the side facing up. Place the black bean veggie burgers gently in the saucepan and let them cook for about 5-8 minutes, until you can smell the patty and the bottom is golden brown. Flip and cook the other side for a few minutes. Alternatively, you can bake the vegan black bean burgers at 350 degrees F for 15-20 minutes, until the patty develops a thin crust on the outside.